hopefully his insurance will cut you a check to cover some costs? maybe get you some upgrades versus buying stock? A yes to both of those. I'll have it looked over at my family's body shop once I go home for Thanksgiving. 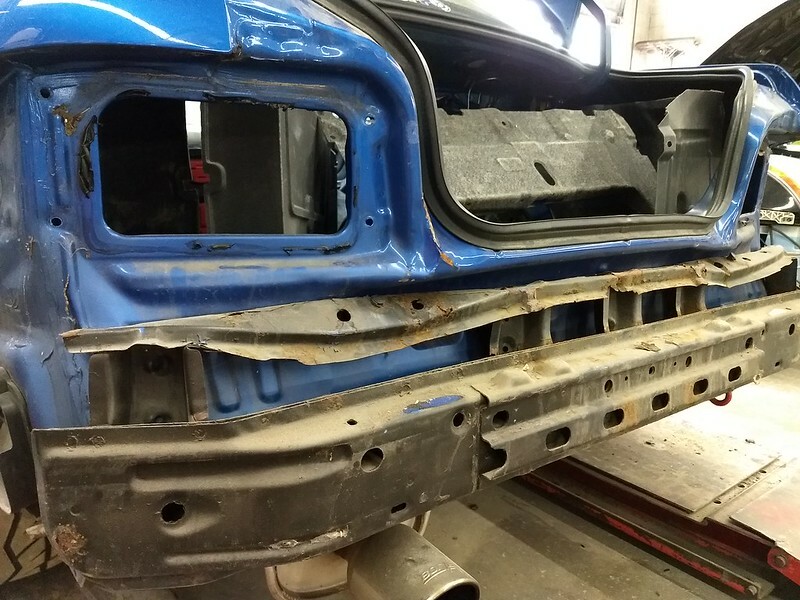 I'm hoping a smooth bumper with some spats is what its going to end up with, maybe some JDM tails too. We'll see. Just got home from the bodyshop. Was quoted just over $5k total. I really just want to get the car fixed at this point, I'm really tired of not having a trunk. Hopefully it'll be solved soon. 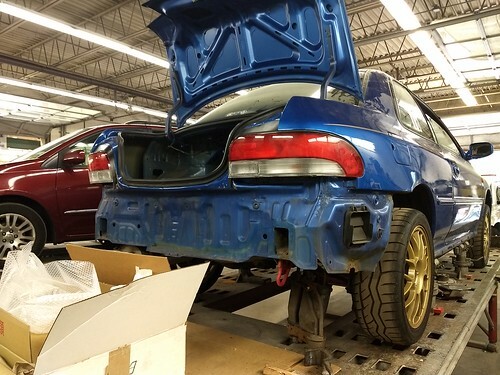 was the rear body panel pushed in?? Its been slow on the car front for me lately. 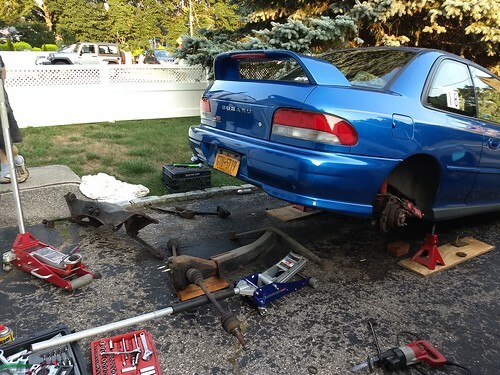 I picked up a Jap GD STi rear subframe to replace my rusty stock one. It was $75 and is rust free. It has the solid mounts too. Still nothing as far as fixing the car goes. I was told the insurance company was contacted by the other party but nothing happened. I texted the guy again and he told me to have my parents call his dad so its looking like they still don't want to involve the insurance company. Hopefully it'll be solved soon. I'm tired of having a trunk that doesn't work. Nothing too new, Just collecting parts for when I take most of the suspension apart for a refresh while the bodywork is being done. A Group-N trans mount is on its way along with some Kartboy crossmember bushings. Almost certain its the original trans mount so this should a much needed upgrade. Picture is from last spring while I borrowed my dad's PF01s. Dreaming of warmer weather and hitting the track. Long time, no update. The winter was pretty uneventful. 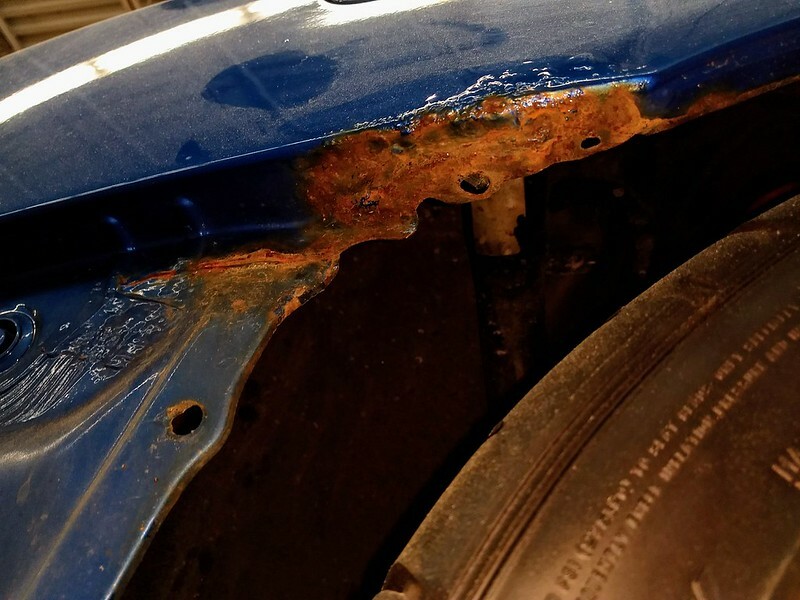 I continued to use the RS for school so no bodywork had been done, and the quarter rust got worse. Now that I'm home, Things have started to happen. I got home around the middle of May, and left for vacation in Germany on the 25th.I dropped the car at the body shop that day and they've had the car since. This is what it looks like currently. I got the call from them a few hours ago saying that the negotiations are done and I can start looking for parts. I have probably more money than I need to find everything as well. Now I have to find some tail lights as well as a complete smooth bumper setup. Not sure if I should look for that stuff second hand or try to go through Rallispec. And thats just the body related stuff. While the car is at the shop, I need to go there on a Saturday and put in all my new rear suspension parts. At this point its a GD STi subframe, pink GD STi lat links&trailing arms, A.P. Suretrac, and a TiC Klunk Killer kit. 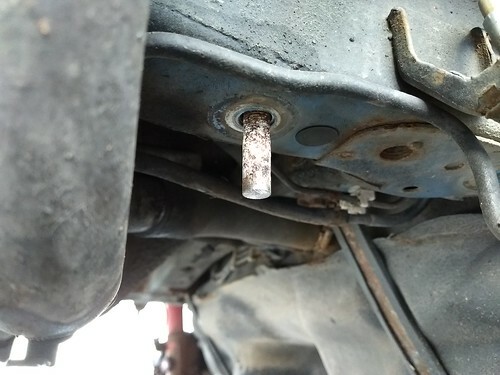 That should pretty much get rid of all of the wasted bushings in the back. I'm gonna try to hook up my MapDCCD too. 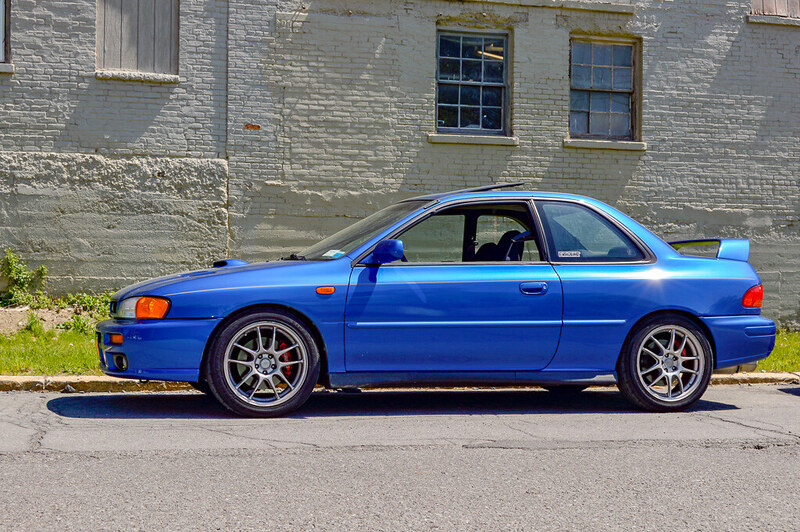 Unfortunately, when I was putting my summer wheels on, I found that my right rear strut was blown, so I'm looking to pick up some new GD length ones for the rear to go with the lateral links. Lot's of stuff to do now, it'll be an interesting summer. Bonus pic from the wash before it was hit. 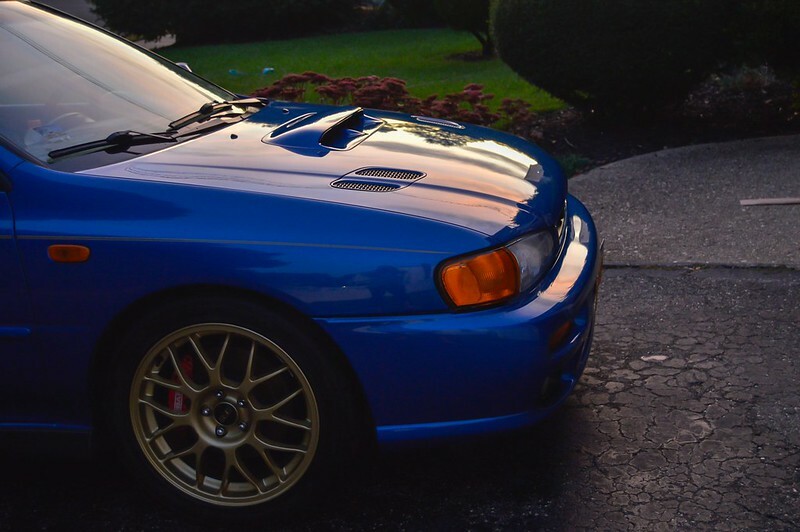 It's good to hear that your RS is finally being put back together. because it's a good looking car! Progress is being made. I took this while dropping off the used smooth bumper and new JDM beam. All of the stuff for the Jap license plate bracket and plate lights were delivered from Rallispec this past Monday, so the shop has everything they need in parts. 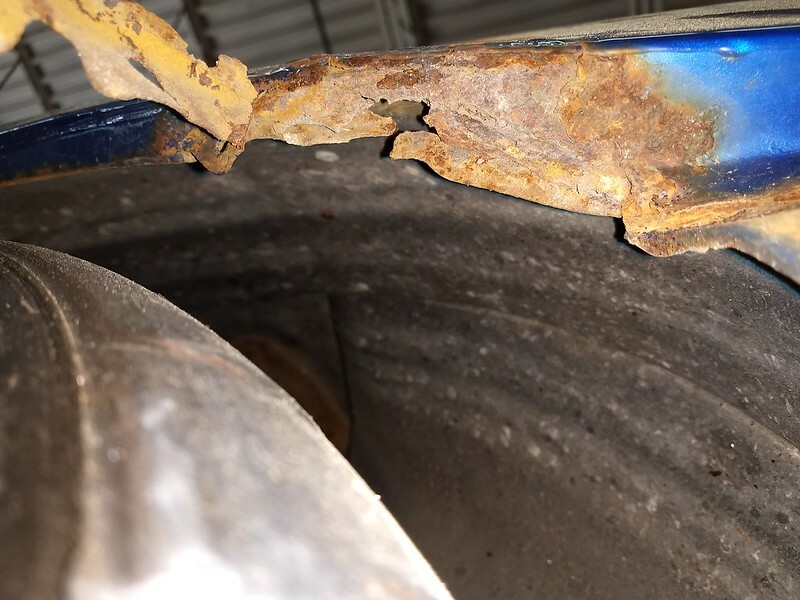 They insisted on making pieces for the quarter panel rust which does have me a little concerned though. The picture was taken two weeks ago, so I'd imagine they are relatively close to completion. Once all of the bodywork is done, it's time to move on to the rear suspension. I Bought a whole bunch of new bolts for the underside, as well as new bearings for the A.P. Suretrac. I still need to pick up two new rear struts, but I'm sorta holding off in hopes I find a decent set of used Bilsteins or KWs. I like the AGX/GC combo, but I feel like it could be better. I still have to figure out why I overheated at the track too. Still, a lot of work to do this summer. I have been fairly busy. Got the car back two weeks ago, it isn't perfect but I can certainly live with it. Since then I've put in the Group N trans mount and the Kartboy crossmember bushings. Coming from a shot stock mount, the Group N piece is fantastic. Combined with the other bushings its one of my favorite things I've done to the car. Should've gotten that stuff much sooner. Everything but the rear struts and hubs is out. The new rear bumper/bodywork looks pretty good too. The most difficult part was having to Sawzall through the lateral link bolts. Though I did assume that would have to happen so there are two new ones sitting in my garage. But everything other than the big bolts came out just fine. Well.... almost. Three of the subframe bolts came out just fine. One did not and predictably broke the nut off inside the body. Good thing I have a welder. Tomorrow I pick up all of the bits to rebuild/reseal my rear diff and put in the A.P. Suretrac. Once that's done, I'll fix the captive nut, somehow get the lateral link bolts out of the knuckles and then move on to replacing the rear struts with the replacement AGX I bought. Piece of cake, right?